Sterilised cats have a different metabolism that can make them quieter and more sedate, with an increased appetite. 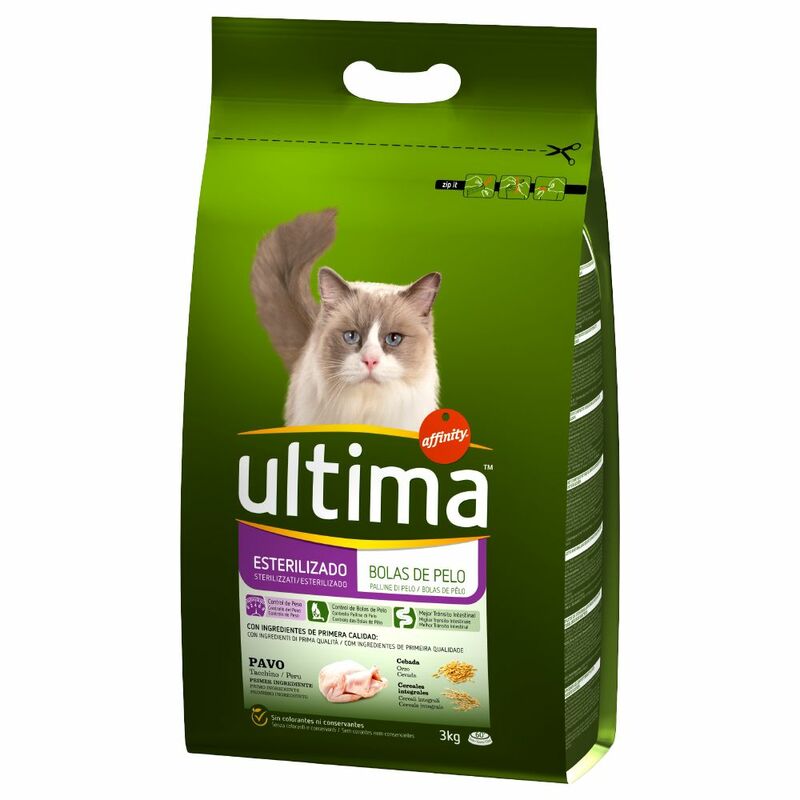 Ultima Sterilised Hairball has been specifically designed to support your sterilised cat's wellbeing. With its low fat and decreased calorie formula, this balance dry food helps maintain and control weight, while the added ingredient, L-carnitine, boosts metabolism and fat burning. The vegetables and whole grains in the recipe have a low glycemic index, meaning they are slowly digested, absorbed and metabolised and cause a lower and slower rise in blood glucose. Some sterilised cats like to devote themselves to grooming, which can make hairballs an iΒue. The plant fibre and malt extract in Ultima's recipe support the removal of hair from your cat's gastrointestinal tract, counteracting the formation of hairballs. With turkey as the main ingredient, this high-quality food is particularly tasty and easily digestible. In addition, there are whole grain cereals, vegetables and a valuable mix of vitamins, minerals and trace elements. Now you can provide your sterilised cat with a nutritious, tasty food that has been perfectly tailored to its needs! Ultima Sterilised Hairball – Turkey and Barley at a glance: Complete food for adult cats Specially adapted to the needs of sterilised cats with an increased appetite and a sedentary lifestyle Anti-hairball formula: with plant fibre and malt extract, which aid in the removal of swallowed hair and prevent the formation of hairballs Low fat and calorie: light formula, ideal for weight control after sterilisation With L-carnitine: can boost metabolism and fat burning 15%: tasty, light and easily digestible, with valuable animal proteins Low glycemic index: with vegetables and whole grain cereals that provide natural sugars slowly. Contains taurine: a vital building block for cats, can promote heart strength and good vision Balance and complete nutrient profile: perfectly adapted to the requirements of sterilised cats No colouring or preservatives Gently steamed: locking in the flavour and nutrients Delicious kibbles: dried in the oven Resealable zip bag: for long-lasting freshneΒ Quality and safety: strictly controlled production proceΒ with high standards.